^ "Australian Football - Port Adelaide Football Club - Bio". australianfootball.com. Retrieved 16 October 2015. 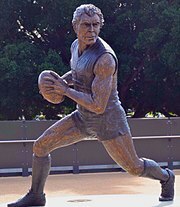 ^ "10 things you probably don't know about the Port Adelaide Football Club… – portadelaidefc.com.au". Retrieved 29 May 2015. 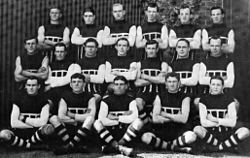 ^ "First of firsts: Port Adelaide v Richmond 1889 - portadelaidefc.com.au". portadelaidefc.com.au. Retrieved 16 October 2015. ^ "Australian Football". australianfootball.com. Retrieved 16 October 2015. ^ "Championship football port adelaide invincible soundly defeat combined league team". Daily Herald. 15 October 1914. p. 5. Retrieved 13 July 2015. ^ "Australian Football - Angelo Congear - Player Bio". australianfootball.com. Retrieved 16 October 2015. ^ "Family tree. Details of William Harold Oliver (1891-1958)". www.users.on.net. Retrieved 16 October 2015. 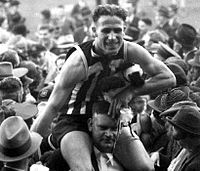 ^ a b "Australian Football – Port Adelaide Football Club – Stats". australianfootball.com. Retrieved 22 May 2015. ^ "1955 Exhibition Match vs Port Adelaide". demonwiki.org. 30 May 2014. Retrieved 20 January 2015. ^ a b "Australian Football - Port+Adelaide Football Club - Bio". australianfootball.com. Retrieved 16 October 2015. ^ "Revisiting the South Australian license saga of 1991". The Roar. Retrieved 16 October 2015. ^ "Stateline South Australia". www.abc.net.au. Retrieved 16 October 2015. ^ Will Swanton, Courtney Walsh (4 March 2014). "And the big man flies". ^ "The official website of the Australian Football League - AFL.com.au". afl.com.au. Retrieved 16 October 2015. 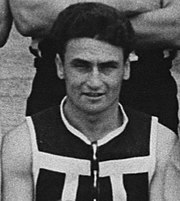 ^ "Boak to lead new era at Port Adelaide". portadelaidefc.com.au. Retrieved 16 October 2015. ^ "Port to farewell AAMI in prison bars". portadelaidefc.com.au. Retrieved 16 October 2015. ^ Rucci, Michelangelo (16 July 2014). "Port Adelaide Denied Opportunity to Wear Heritage Jumper at First Friday Night Match at Adelaide Oval". ^ a b c "From the CEO: September 3, 2015 - portadelaidefc.com.au". portadelaidefc.com.au. Retrieved 26 October 2017. ^ a b "Australian Football - Port Adelaide Football Club - Bio". australianfootball.com. Retrieved 27 September 2017. ^ "Subscribe to The Australian". www.theaustralian.com.au. Retrieved 22 October 2016. ^ McClure, Sam (27 September 2016). "AFL 2016 finals: Port Adelaide heading to China in late May as AFL ticks off on international game". The Age. Retrieved 22 October 2016. 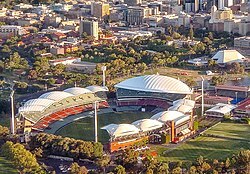 ^ "Statement: Port Adelaide accepts SANFL invitation". portadelaidefc.com.au. Retrieved 16 October 2015. ^ "AFL Tables - Port Adelaide Win-Loss Records". afltables.com. Retrieved 3 July 2018. ^ "Australian Football - Tim Evans - Player Bio". australianfootball.com. Retrieved 28 May 2017.